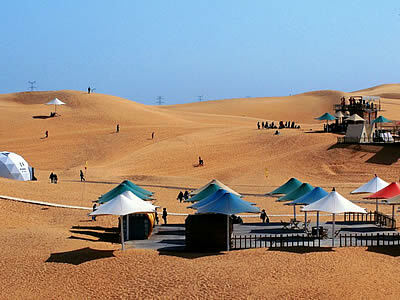 Xiangshawan Bay (Whistling Dune Bay), Genghis Kha’s Mausoleum. * Admire the renowned Genghis Kha’s Mausoleum to know the story of this hero. 1. In Inner Mongolia, the temperature by the daytime is hot, in evening or in morning is low, so please prepare more cloth. 2. The commodities in the Xilamuren Prairie Tourist Accommodation Area is kind of expensive. The Horse riding there is also not cheap. 3. Maybe the local guide will introduce you to take the roast sheep leg. This is the most famous local cuisine - but it is also not cheap. If you do not like, just tell to the guide clearly. It is no problem. 4. The sand in the Xiangshawai Desert (Whistling Dune Bay) is very very fine. No matter how careful you will be, it will get into everywhere on you. So please take care of your DC there. On your arrival in Hohhot for your exciting journey you will be met at the airport or train station by your personal guide, who will take care of you during this journey. Transfer service to your hotel in downtown Hohhot. If you need any advice, tips or help please just ask your guide. Serving as the capital seat, Hohhot city is located in the heart of the Inner Mongolia Autonomous Region. It is 670 km away from Beijing. In Mongolian, Hohhot means the "green city". It is the regions political, economic, cultural and transport center. 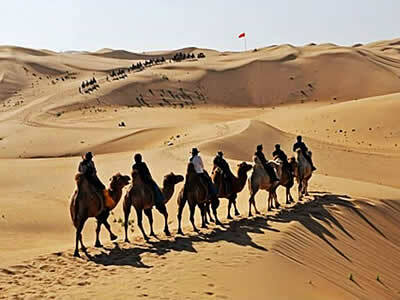 It is also a city rich in famous, interesting historical sites and with distinctive ethnic features close to stunning grasslands and the Gobi desert. Todays first destination is the Dazhao Lamasery. Built in 1580 as the oldest Lamaism Buddhist temple in Inner Mongolia, Dazhao Temple owns its fame to a visit by the third Tibetan Dalai Lama in 1586, when he came to dedicate the Silver Buddha statue. As a consequence Hohhot became the most important religious center for people from all over Mongolia who came to worship. Another notable event in the temples long history was a visit by Emperor Kangxi during the early part of the Qing Dynasty (1644-1911). The temple now is the best-known of all lamaseries of Geluk Tibetan Buddhism as well as the biggest and most complete wooden structures ever built in Hohhot which is still retaining its former grandeur today. This Lamasery boasts the impressive buildings, splendid statues, delicate frescos, musical instruments and fine collection of Buddhist scriptures. Among which the most notable are the Three Marvelous Treasures, a title given to the Silver Buddha, the carved dragons on the huge golden pillars on either side of the statue and the murals commemorating the Emperors visit. 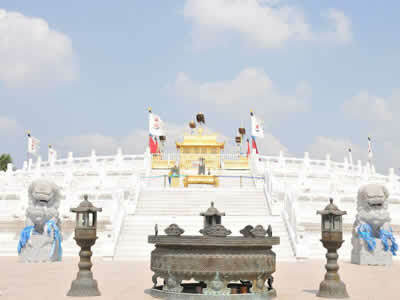 The next place you will visit is the Five-Pagoda Temple. Built of stone and bricks in 1732, the structure is 13 meters high and has three parts: the base, the seat and the top. The very unusual feature of it is there are 5 rooftop Tibetan style Pagodas (dagobas) on top of it which display an unusual array of Bodhisattvas and Buddhas. In the lower part of the seat there are exquisite inscriptions of Diamond Sutra written in Mongolian, Tibetan and Sanskrit. The upper part of the seat has a niche for a statue of Buddha and four Devarajas. More than 1500 relief sculptures of Buddhas are engraved on the five dagobas. The astronomical chart with Mongolian inscriptions on the northern wall is the only one of its kind in the world. After that, your tour will move on to the historical milestone in the form of the ancient architecture: the Suiyuan General Office & Residence. Built from 1737, this is for the highest official in Inner Mogolia Area in Qing Dynasty (1644-1911 AD). 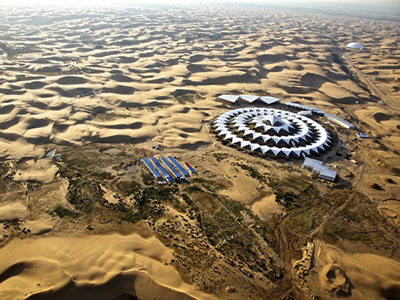 Now it is an ideal place for us to know the history and story of Inner Mongolia in ancient time. The final place you will visit today is Inner Mongolia Museum. The Museum focuses on collecting artifacts relating to ethnic history especially the northern tribes called Hun, Xianbei, Qidan, Mongolians and others. It holds 44,000 objects among which quite a few are rare treasures seldom seen in China. Besides this, the museum is renowned for its extensive collection of massive dinosaurs, mastodons, and many other kinds of fossilized remains from the Mesozoic period that have attracted global attention. Today, you will drive for around 90km/1.5 hours to Xilamuren Prairie. Upon arrival, enjoy the most ceremonious welcome ceremony - Down Horse Wine. Have the traditional Mongolia food for lunch. Meanwhile Mongolia girl will propose a toast to you and present Hada, traditional ceremonial scarf used in Tibet and Mongolia, to you. In the afternoon, Enjoy the Mongolia style rassle or Horseracing performance. You can also have to opportunity to ride horse to visit Mongolia herdsman’s home, to know what the local life is. – these activities will be paid additionally by yourself. Please take care of yourself when you take the horse riding in the Xilamuren Prairie. Although most of the horses for tourists there are the meek ones, sometimes these horses will also attack against each other themselves. Please think it over before you decide to ride the horse on the grassland. These activities are not included in our tour contract (we will sign the tour contract with our tourists on every package tour.). The activities on the grassland will be chosen and paid by yourself there. We do not take responsibilities for any problems if happened on these activities. Overnight in the deluxe tent in the grassland. Because of the local condition in the Xilamuren Grassland, even the deluxe tent there also not as comfortable as the star-rating hotel. There is no 24 hours hot water and 24 hours electricity there. The hot water is from the solar heating system. Anyway the beddings are clean and it is warm inside the tent at night. The hot water is also hot and sufficient if you do not take very long time shower. 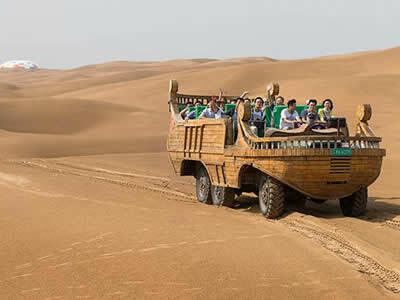 Today you will ride the private car for around 320km/4-5 hours to arrive at one of the three most famous Resonant Sand Hills in China, Xiangshawan Bay (Whistling Dune Bay) Tourist Area which featured by its amazing desert landscape, whispering sand dunes. sand lake and the oasis, etc. The sand dunes stretch as far as the eye can see and form a magnificent landscape. On the way, you will pass the mother river of China, Yellow River, the 2nd largest river in China. 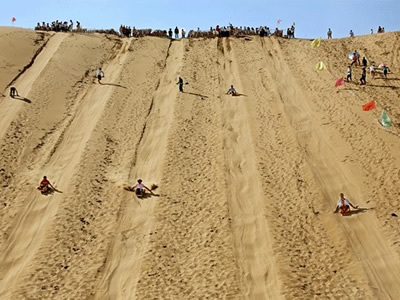 On the sands, you will have the opportunity to take some sand activities yourself, such as desert outer space ball, desert surfs adventure over the massive sand dunes in the car , riding on a came –these activities will be chosen and paid by yourself there (Our quotation only includes the entrance fee to the desert.). Please kindly note: The desert surfs adventure in the car is bumpy and thrilling. Sometimes it can be dangerous. Please think it over before you decide to take it. The activities at the desert are not included in our tour contract (we will sign the tour contract with our tourists on every package tour.). 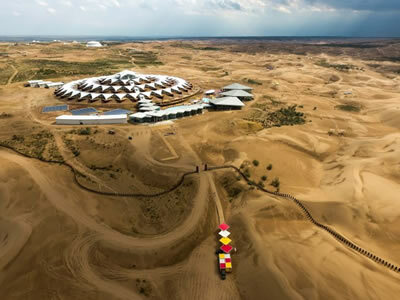 When you arrive at the desert, you can choose and pay the activities by yourself. Overnight at hotel here to enjoy more in this sand area. 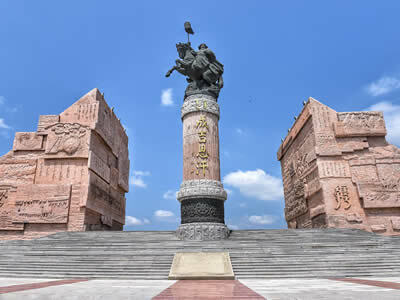 After breakfast, you will drive to Ordos City for around 120km/1.5 hours to visit the famous Genghis Kha’s Mausoleum. Genghis Kha set up the biggest empire in human history in the early 13th century. The 5.5 hectares mausoleum includes three giant yurt halls which house coffins of the Khan, his wife, his son and his generals. But in Genghis Kha’s Mausoleum, only his clothing was buried in memory of the great leader. In the middle afternoon, you will drive north for around 185km/2.5 hours to the airport or railway station at Baotou City for your next destination. Take a nap on the way and bid a fond farewell to Inner Mongolia. Your guide will look after you until your safety at the correct airport check-in desk or railway station check-in channel to complete your amazing tour.